In advance of his April 2 lecture, Living and Working with Free Trade: Prince Edward Island’s Fisheries under Reciprocity and Confederation, 1854-1873, Professor Brian Payne, an expert on North American resource economics, spoke to the Reporter. 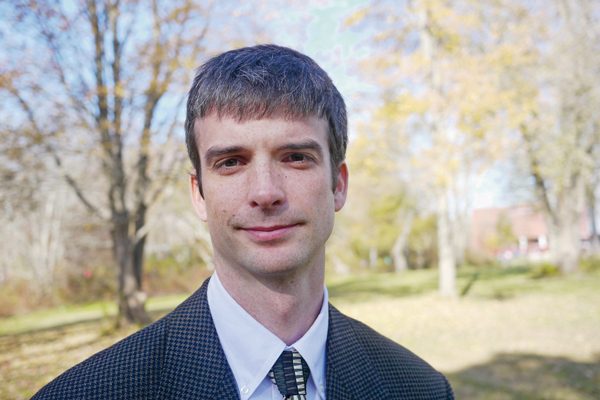 Brian Payne’s teaching and research interests focus on North American resource economics, with a particular interest in the labor of resource extraction. The McGill Institute for the Study of Canada (or MISC) will be hosting a lecture on Thursday, April 2, by visiting Professor Brian Payne, from Bridgewater State University, Massachusetts. Payne’s teaching and research interests focus on North American resource economics, with a particular interest in the labor of resource extraction, and he is the author of Fishing a Borderless Sea: Environmental Territorialism in the North Atlantic, 1818-1910. The Reporter caught up with Payne in advance of his lecture, Living and Working with Free Trade: Prince Edward Island’s Fisheries under Reciprocity and Confederation, 1854-1873. You’ll be visiting McGill from your home institution of Bridgewater State University in the state of Massachusetts, where you’re an associate professor of history and Canadian Studies, What is it that attracted you to the field of Canadian Studies? I grew up in the small town of Youngstown, New York; directly across the Niagara River from Niagara-on-the-Lake, Ontario. As such, I’ve always been aware of borders and border crossing. As an undergraduate student I had an opportunity to take a Canadian history class and I become intrigued by understanding North American history from a continental perspective rather than just a national history of the United States. I decided to go to the University of Maine for graduate school because I wanted to study U.S.-Canadian history. There I began a more academic investigation of borders, border crossing, and border towns. As I developed a more specialized area of research I focused in on the North Atlantic fisheries and I have since spent about fifteen years trying to understand the intersection between state diplomacy, global economics, and migrant fishing laborers. Throughout all my studies, however, I have retained that initial interest in understanding North America beyond the limits of individual nation-states. You are coming to Montreal as part of a joint, rotating lecture series in Canadian Studies series organized by MISC, Bridgewater State University and Plattsburgh University – what made you want to participate in this series? Bridgewater State University has an excellent Canadian Studies program and it’s getting better every year. In addition to a Canadian Studies minor we have study abroad programs, study tour programs, regular lectures, film nights, and one large spring symposium. There is a lot of energy among the Canadian Studies faculty and it’s one of the best parts of my job. I’m thrilled to have the opportunity to contribute to the growth of BSU’s Canadian Studies program by strengthening our ties with both SUNY Plattsburgh and McGill University. Your lecture will focus on Prince Edward Island Fisheries under Reciprocity and Confederation in the 1800’s. Why did you choose this as the focus of your lecture? My interest in Prince Edward Island began during my dissertation research, but I was never able to fully develop it as my dissertation began to focus on Nova Scotia. Last year I participated in a NiCHE (Network in Canadian History and Environment) workshop that examined the connections between Canadian Confederation and the Canadian environment. I then received a Faculty and Librarian Research Grant from BSU to spend two weeks researching at the Provincial Archives of PEI. The end result was a more complete economic history of the impact that Reciprocity and Confederation had on the Island’s fish community. I decided to present it in this lecture because I think we need to spend more time thinking about the impact that international economic policies and trade agreements have on the actual people who work in those economies and the communities in which they live. The paper is an effort to understand labor and community within the broader context of international economics. How do you think the early history of Maritime fisheries has influenced where the industry is today? This is a tough one. History is not timeless; history does not repeat itself. History emerges from a very specific context rooted in the past. This isn’t to say that we can’t learn from history in such a way as to shape our understanding of today. What the early history of the fisheries tells us is that it has always been international. The simple truth of the economics is that the best fishing grounds are located in one territorial zone while the best markets are located in another nation-state. This international dynamic has made regulation, conservation, and sustainable growth far more difficult to achieve. Even in localized fisheries, localized law does not always work to protect the resource from over-exploitation. Fish are mobile and freely swim from one jurisdiction to another. As such, no one state can simply pass a law and regulate fish extraction from the North Atlantic. What we learn from this is that we need international cooperation, but we need an international cooperation that considers the labor, the resource, and the markets. This is no easy task and it has baffled administrators and fishermen from two centuries. Brian Payne’s lecture, Living and Working with Free Trade: Prince Edward Island’s Fisheries under Reciprocity and Confederation, 1854-1873, will be held at McGill’s Faculty Club (3450 McTavish) in the Heritage Room. You can learn more here.